Our team of asset management professionals will design a wealth plan that evaluates your current financial situation and into the future to attain your financial goals. We provide regular reviews and modifications, assuring that your wealth plan is current and dynamic. Life transitions may result from the loss of a relationship by a death, divorce or retirement. Likewise, a life transition may encompass an addition to the family by marriage or birth of a child. Leaving the workforce eliminates the traditional employer/employee relationship as one switches from asset accumulation to paying the bills from investment income, pension income or other financial resources. Business transitions entail succession planning which is often a future consideration when one is in the process of building a business. Our team believes the ultimate exit from a business to realize the value from a lifetime of work is at least as important as growing the business. Whether the business is sold internally, externally or passed to family members, the founders want the transition to be seamless, know the company is in good hands and has the resources to prosper. Generational transfers involve the passing of financial assets, values and opportunities to heirs and the causes one is passionate about in a tax efficient manner. Generational transfers of wealth may occur during life or upon death with or without gift and/or estate tax considerations and include items such as providing for educational funding or creating a legacy. Our wealth management professionals are qualified and experienced in handling the emotional, financial and relationship aspects of life transitions and wealth transfers. 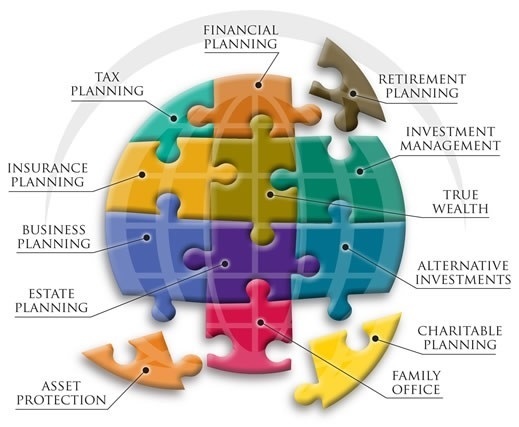 Through your holistic wealth plan, you’ll be equipped with the proper resources to address these transitions. If you can’t imagine driving to an unknown destination without directions, then why drive towards your retirement without a holistic wealth plan? We will guide you from where you are to where you want to be by utilizing a sophisticated program that tracks your finances all the way through retirement. Our wealth plan doesn’t just track your finances; it also tracks your life. You can digitally store your important information in a secured vault that’s easily accessible to you. Investing in alternative assets involves higher risks than traditional investments and is suitable only for sophisticated investors. Alternative investments are often sold by prospectus that discloses all risks, fees, and expenses. They are not tax efficient and an investor should consult with his/her tax advisor prior to investing. Alternative investments have higher fees than traditional investments and they may also be highly leveraged and engage in speculative investment techniques, which can magnify the potential for investment loss or gain and should not be deemed a complete investment program. The value of the investment may fall as well as rise and investors may get back less than they invested. Asset protection plans should be developed and implemented well before problems arise. Due to the fraudulent transfer laws, asset transfers that occur close in proximity to the filing of a lawsuit or bankruptcy can be interpreted by the court as a fraudulent transfer. Proper structuring of these assets is imperative please seek proper legal and tax advice prior to engaging in re-titling/structuring of any assets. Please note that laws are subject to change and can have an impact on your asset protection strategy.